A gentle cleansing wipe as part of a daily regimen recommended by eye care professionals. 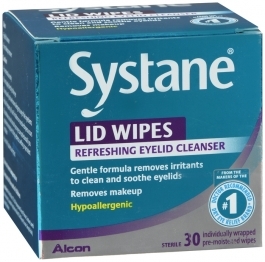 These pre-moistened wipes remove debris and makeup that cause eye irritation. Rub the closed lid wipe pouch to develop lather, then open. Close eye, then sweep lid wipe gently across eyelid several times. Using a fresh wipe, repeat process on the other eye. Rinse both eyes with clean, warm water and pat dry.